Infection control experts agree that cleaner hospitals are safer hospitals. But while hand washing and disinfecting hard surfaces like countertops, floors, bed rails and instruments have helped reduce infection rates, their effectiveness is limited. These procedures rely on proper training, diligent behavior and compliance, all of which are difficult to administer. What’s more,hands and hard surfaces are quickly and easily recontaminated. Infection prevention policies do not address the most prevalent and overlooked component of the healthcare environment – Soft Surfaces. Hand sanitization is only effective until recontamination occurs—which happens immediately upon touching a contaminated soft surface. Regular behaviors like opening a privacy curtain or retrieving a pen from a uniform pocket can cause recontamination. The most effective solution is one that doesn’t require behavior modification or training. Which is why using fabrics made with X-STATIC® broad-spectrum antimicrobial fibers are the right solution for long-term bacterial management for soft surfaces. By eliminating bacteria on the textile surface, you reduce the risk of cross-contamination. Soft surfaces cover 90% of a patient’s contact environment, and are constantly exposed to bacteria between launderings. 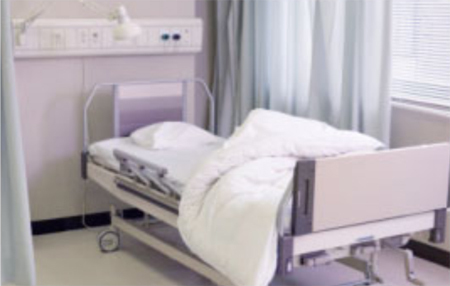 Because of the frequency of contamination, laundering bed linens, uniforms and scrubs, privacy curtains,patient gowns and divider curtains is insufficient and does not reduce crosscontamination in practice. Extensive antimicrobial laboratory testing has been done on fabrics containing X-STATIC. The most overlooked problem area. Studies show that soft surfaces—privacy curtains, bed linens, uniforms and scrubs—can harbor bacteria and pathogens, causing recontamination during frequent contact. However, they’re often ignored by infection prevention protocols. Laundering alone isn’t effective, because fabrics begin to recontaminate immediately after being put in use. Despite today’s extensive efforts to prevent the spread of germs and bacteria, Healthcare Acquired Infections (HAIs) continue to be one of the world’s most pressing and expensive healthcare problems. Treating HAIs costs more than $30,000 per patient. To make matters worse, CMS and insurance companies will no longer reimburse hospitals for HAIs deemed preventable. While today’s standards for preventing HAIs focus on patient screening, hand washing and sterilizing hard surfaces, soft surfaces remain unaddressed. And this missing step is perhaps the greatest challenge to reducing HAIs. As infection preventionists we follow evidence-based best practices to help prevent and reduce infections and ultimately achieve zero healthcare-associated infections (HAIs). While we have long been scrupulous about implementing and maintaining infection prevention protocols for hand hygiene and hard surfaces, the effectiveness of these procedures is compromised without incorporating soft surface fabrics into an overall infection prevention program. Considering that soft surfaces — privacy curtains, lab coats, uniforms, scrubs — constitute 90 percent of a patient’s environment, it’s time to give them the attention they deserve. This means examining existing and conducting additional research, and considering the promising role silver-based technologies may play in soft surface infection prevention. Several recent studies underscore the important role soft surfaces can play in the transmission of microorganisms. Physician white coats and ties, nurse uniforms and scrubs have been shown to be colonized with pathogenic organisms. As such, they are a potential source of cross-contamination.1, 2 One study noted that the most contamination occurred in areas of greatest hand contact (i.e., pockets).2 Overlooking soft surfaces creates additional potential for recontamination of already washed hands before patient contact. The limited guidelines available for soft surface fabrics come from The Association for periOperative Nurses (AORN). Its current recommendations include not allowing home laundering but having an accredited laundry facility for washing healthcare textiles, changing scrubs on a daily basis and ensuring that fabrics for surgical attire be tightly woven of a thread count of 560 × 395 threads/10 cm or greater. While laundering healthcare textiles at a proper facility as opposed to the home is a recognized requirement, this alone does not ensure proper prevention. Even if proper procedures are followed, clinical evidence shows fabrics are quickly re-contaminated after being put back in use and can contain bacterial contamination at the beginning of a shift. With the exception of the operating room arena, uniform care tends to fall under human resource — not infection prevention — protocols, where we expect clothing to be “clean and professional” and washed in the home setting. Infection prevention protocols for soft surface fabrics used by patients are even less common. These protocols are usually limited to noting that patients’ linen and privacy curtains should be regularly changed. What determines “regularly” is also unclear. Although they can be touched by dozens of people daily, most large facilities clean privacy curtains every quarter at best, unless there is obvious contamination or if they came in contact with a patient who was found to have an MDRO. In smaller facilities, they may be changed even less frequently. In addition, due to lack of staff and time, the IP manager may need to rely on housekeeping to manage this practice. Unfortunately, rules and guidelines are less strict regarding the reporting of these items and many don’t have a formal procedure to do so. Other considerations are the extra staff time and paperwork needed to keep track of laundered items and the varying contamination rate in different departments. Critical care facilities like the Emergency Room, ICU and surgical departments will have a higher overall rate. With the increasing introduction of organisms that are harder to treat, silver has begun to regain its place as an antimicrobial weapon in healthcare. Patient care items such as silver coated foley catheters, silver imbedded central line catheters, and wound dressings all use silver-based agents to minimize colonization and infections. The same technology is now being applied to develop infection prevention textiles. Brands like X-STATIC from Noble Biomaterials create silver based fibers that are woven directly into lab coats and privacy curtains. The antimicrobial strength of the finished product is then tested by a third-party. The continuous release of silver ions naturally inhibits the growth of bacteria and has been shown to eliminate 99.9 percent of pathogenic organisms directly on the fabric.5 X-STATIC antimicrobial technology has also been used by U.S. Special Forces, Olympic athletes and NASA astronauts for years. In healthcare, it has been proven successful in leading wound care brands, such as Systagenix and KCI. For more information on silver fiber technology, visit www.InfectionPreventionTextiles.com. Healthcare associated infections continue to take lives and cost the healthcare system billions of dollars. Reimbursements for these conditions will continue to decrease and mandatory reporting will put additional strain on infection prevention staff time. Effective HAI reduction must incorporate soft surface management as part of an overall bacteria-reduction strategy. The guidelines in the area of soft surface infection prevention are lacking and silver-based textiles should be considered as a promising solution. Unlike many other forms of infection prevention, implementing silver-based textiles in an overall IP program requires no additional training, behavior modification or compliance requirements from staff. 2. Yonit Wiener-Well MD. Nursing and Physician Attire as Possible Source of Nosocomial Infections. Amer. Journal of Infection Control 2011; Vol. 39, Issue 7; 555-559. 4. Perry C, Marshall R, Jones E. Bacterial contamination of uniforms. J Hosp Infect 2001; 48(3): 238-41.